Reductive materialism says everything can be traced back by purely material causes to material itself. This is the most common view in modern science and predominates among atheists, skeptics, humanists, and many agnostics. One key claim in this camp is that mind is just brain or just a product of the brain. While these two options have some critical differences I’m going to treat them together under the heading “mind-brain identity thesis”. This thesis is quite popular, but are there reasons to reject? I think so. 1) It amounts to a universal negative claim, and those are notoriously hard to prove. To say with 100% certainty that “the mind is nothing but the brain” one must know EVERYTHING about ALL brains and minds. That’s a lot to know, and its doubtful that anyone knows that. To be fair though, we rarely operate on 100% certainty. We can still have epistemically responsible claims with imperfect knowledge. Suppose we graded that context back a bit and made that claim, not with 100% certainty, but with “high probability”. Is it still a responsible claim to make? Still no. We do not know even MOST everything about MOST brains and minds. 2) Materialism is riddled with holes. Materialism has a remarkably hard time accounting for things like qualia (subjectively felt bits of experience), feelings, consciousness, deliberation, intentionality, free-will, and most everything located under the derisive term “folk psychology.” Now that doesn’t stop materialism, nor should it. Most every theory of mind today has a lot of explanatory gaps and we can be fine with ignorance as long as we are trying to pass through it (instead of camping there). But, materialism has a tendency to not “explain” so much as “explain away” things that you and I directly experience as real. This tendency to explain away things like free-will or consciousness (see eliminative materialism for example) counts against the theory to the extent that those things seem likely, or are otherwise known to be real. If materialism EXPLAINED them without trying to go further and EXPLAIN THEM AWAY then materialism might not seem very porous. But in the meantime, it does little good to tell people that their conscious experience is ultimately illusory since our free-will is just a mysterious shadow cast upon a jumbled set of innumerable deterministc forces making us say, do, think, believe, and be everything about us. That’s a fine assertion, but unless that assessment is just as compelling, just as obvious, just as directly known or directly observed as our own first-hand immediate experience of our own selves then it hasn’t earned our agreement. 3) Materialism argues from silence. There are valid and invalid ways to make an argument from silence. A valid way to do it is to find a context where some “voice” is rightly expected. For example, “Senator Coburn could not be reached for comment in the last three weeks ever since his step-daughter spoke out about the sexual assault.” That is a valid argument from silence. For a senator to keep his mouth shut for 3 weeks is itself a miracle, but when any words of his would be met with uncomfortable questions about the recent accusation, then his silence suddenly takes on a meaningful sheen. He may not be guilty, but the silence is at least suspicious and can count as some evidence if not conclusive evidence against him. That would be an argument from silence if the conclusion one draws is that, all else being equal, Senator Coburn is more likely (than not) to be guilty of something related to his stepdaughter given his 3-week silence about that accusation. However, there are invalid ways to argue from silence too, hence we have the category of “argument from silence fallacy.” Materialism has basically two ways to account for mind. 1) Deny it’s existence entirely (as in eliminative materialism, or related forms) and 2) Emergence (which is sometimes overlaid or identified with the term “supervenience”). With the second category, the mind is said to be an emergent property of the brain. The theory is that when the neurons that compose the brain are sufficiently developed and properly arranged and activated “mind” emerges as a product, function, feature or description of that brain. Just as three adjoining lines can have the property of ‘triangle” so billions and billions of neurons can have the property (or function, or feature or description, etc.) of “mind.” This is all well and good as far as it goes, but there’s a conceptual problem. How does mind emerge from brain? Best I can tell, most every reductive materialist eventually has to admit that they don’t know. There is a complex causal cloud of material forces and somewhere in there, they believe, mind emerges. The sense of “free will” emerges from so many deterministic material causes that we honestly think we have free-will but we just don’t know enough about that causal cloud to be able to make concrete proofs from it to show HOW (the illusion of) free-will reduces to determinism. But have faith, neuroscience and clinical psychology are making great strides every day pointing us back to materialism with every new discovery. Or so they say. Meanwhile, even the amateur dualist, believing that the mind and brain are both real yet not the same thing, should be able to sense that the materialist just swept his ignorance under the rug even as he argues from that ignorance to achieve his conclusions. And all that neuroscience and psychology does not seem to point strictly to materialism unless one was interpreting that data through a filter of presumptive materialism (like methodological naturalism/methodological materialism/reductive materialism). The claim then sounds something like this: “We don’t know how, but we assure you that all the immaterial stuff somehow comes from only material stuff. Now let me tell you about how all of this conversation is really just a meaningless result of so many mindless material forces pulling our puppet strings.” The “great cloud of mystery” (the entire causal set of material forces, known and unknown) is so far silent on how mind would emerge from brain, yet materialists believe (imagine, feel, hope?) that it is saying something to them, something so plain and obvious that you should believe (i.e., put faith in their claim) it too no matter what your own immediate and direct personal experience of “mind” may be. That is a fallacious argument from silence. The materialist is reading into the silence (a.k.a., ignorance) where we lack sufficient context suggesting that inference is in there. 3) Materialism is often self-defeating. So far I’ve treated materialism as a single idea. In fact, materialism can be broken down into many camps. Some of them don’t necessarily submit to this next objection. But not being a materialist myself, I’ll leave the materialists to parse out their own system and see if they can avoid this objection. Here it is: if “everything is ultimately just material” then the immaterial meaning of that very sentence doesn’t exist. Likewise, an idea is not strictly material, so the very idea represented in this sentence, “Everything is material” does not exist. Literally speaking, if materialism were true we could not know that it is true. I’m just an amateur in philosophy of mind, but this conclusion has been reached by greater philosophers than I such as Thomas Nagel (see, Mind and Cosmos). Phrased more generously, it becomes difficult if not impossible to account for meaning in a clean and consistent manner if everything is forced into material categories. Semantics–the realm of linguistic meaning–becomes a rather odd duck if one assumes that meaningfulness is just a relation, property, or substance. Meaning is not strictly identical to the letters and words and sentences that people speak, since then we couldn’t interchange different symbols (as with different languages or different wordings of the same idea) for the same semantic idea. But we CAN use different symbols for the same semantic idea, for example, “I don’t speak Spanish” or “No habla espanol.” But neither is it clear that meaning is always strictly a product of material forces. Some such meanings might be: a bird goes into a mating dance, perhaps having no “mind” in the matter but pure instincts, and that dance MEANS “Let’s mate.” But we humans seem to experience something besides mere instincts, wherein “I-me” dialogue can happen, deliberation, a felt sense of “self” exists, self-transcendent awareness occurs (like, “I wonder how I would look with red high heels and a pigeon on my head?”). All of that “folk psychology” remains as a seemingly real and irreducible experience, which we individuals cannot explain simply in terms of other material things. My sense of self has an apparently immaterial quality which seems odd if not categorically distinct were we to try to account for it in strictly material relations. So if my sense of self were entirely derived from strictly material causes there would seem to be fitting relations between that immaterial experience and the world of material objects. But I cannot honestly say, my experience of “self” is made up of the physical properties of rocks, or of trees, or of pigeons, or of apes, etc. Perhaps my subconscious behaviors can be identified as relations tracing back to neural synapsis in my brain–I have no problem admitting that reality. But when it comes to the conscious experiences I myself have, that seems to what distinguishes me from, say, a zombie replica of me or a robot replica of me. Even if all the physical parts were identical between me and that zombie or me and that robot, we would have to have the numerically same self-experience for the mind-brain identity thesis to hold up. But neither the zombie nor the robot have that self-experience whereas I do. Were I to identify my mind with physical substances metaphorically, then that might work. For example: “My self of commitment is like rock”, but then we’re back into the immaterial realm again. Metaphors and similes point back to the murky waters of semantics and poetic language–neither of which are clearly material. And the whole point of this exercise is to get back to material stuff through causal analysis of (apparently) immaterial stuff. In summary then, crude materialism suffers from self-defeat since the very statement of materialism is not itself material. A more nuanced sense of materialism might allow immaterial properties and relations as emergent features of material stuff, but then the mind still poses a reductive problem if one hopes to account for it by referring to material components. One is left then in the argument from ignorance/argument from silence where it is assumed that sophisticated things like “mind”–which seem to many of us, by direct awareness, to be immaterial–are just properties or relations emerging from a mysterious complex of material causes. 4) The supposed transition from purely material causes to immaterial effects remains an explanatory gap plaguing the reductive materialist. Underlying all of this critique so far is the abiding challenge of how to account the emergence of immaterial things as properties or relations derived from strictly material things. It is not enough to say that meaningful sentences like “materialism is true” can arise if materialism is true, since that only presumes what needs to be proven, namely, that the meaning of THAT sentence is consistent with materialism even though no such thing seems yet to have been proven. 5) Deterministic implications also generate self-defeat. It is quite common for materialists to go so far as to deny free will entirely. Free will is a stubborn citizen that does not submit to the natural laws asserted by reductive materialists. It doesn’t fit in Newton’s laws, or Einsteins theories or in Quantum Theory. It seems to operate, literally, “free” from all of those. In free will, the individual is himself a sufficient and irreducible cause of at least some of his actions. Those actions are his own. And he could have done otherwise. And he is personally responsible for at least some of them. But not everyone believes in free-will. Some folks are determinists, for scientific, philosophical or theological reasons. Determinism says there is no free-will. Reductive materialists are overwhelmingly fond of determinism. So in their view, all states of affairs are caused by prior non-free forces. Now, here’s the problem. If a materialist asserts that “there is no free will” and indeed there is no free will, then that very sentence was forced onto his lips and he had no choice in the matter. He is a coerced witness, and so his testimony should be thrown out of court. He had no ability for rational deliberation since he had to say, do, think, and believe everything that was forced on him. His claim is no more meaningful than if a computer program is made to say, “I’m not a computer, I’m a real boy. I want to sing and dance.” The computer doesn’t “mean” that; it is just rendering the text that was typed into it. 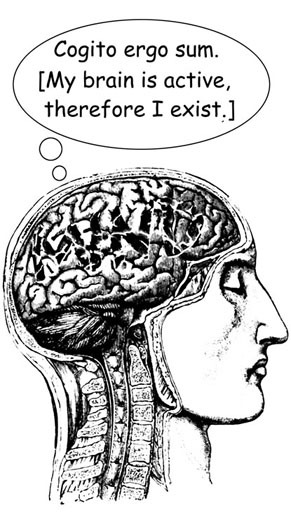 Likewise, no person ever “meant” anything, even if they are uttering things like, “There is no free will.” If materialistic determinism is true and the mind-brain identity theory nullifies free will, then that very statement asserting determinism should not be trusted since it is coerced testimony. It was drawn without rationality, without free deliberation, devoid of semantic content, apart from any intentional attitude, and forced upon the witness by a mysterious cloud of unthinking mindless prior forces. In conclusion, these are just a few reasons to object to simplistic materialism, and the mind-brain identity theory specifically. I have not given a positive case for dualism specifically. But it has been shown here that the mind-brain identity theory is highly problematic. I am an agnostic but not a materialist. I believe that once we became self-aware ( when that happened is unknown) we had freedom of will. Our will could decide whether we obeyed our conscience or our desires when these were in conflict. We also became aware of Richard Dawkins Blind Watchmaker and have been at odds with him ever since. When this self -awareness grew we became moral beings in an amoral universe. Interesting combination of non-materialist agnostic. Permit me to ask what non-material entities do you grant?